So I have been in a crafty mood lately, which I contribute to it being Fall which is my favorite time of the year. I have a lot of ideas of things I want to do but have only completed two of them so far. I always have way too many ideas and not enough time. The two I have completed, were pretty cheap and easiest out of all of them though so I thought I should share. If you are like me, you have tons of makeup items, especially makeup brushes. I am constantly trying to find new ways to keep them organized and visible so I can quickly get to them when I am getting ready. I have seen this DIY or a variation of it on Pinterest and YouTube but I tried to make it my own and I’m very happy with the finished result. A ribbon or accent item of your choice. Directions: fill glass jar with vase filler. Add your chosen accent (in my example it’s a ribbon from a previous months glossybox). Insert your makeup brushes one at a time making sure they are evenly spaced and standing up straight. That’s it. You’re done. How easy is this? Super easy and affordable and only cost $2 to make. 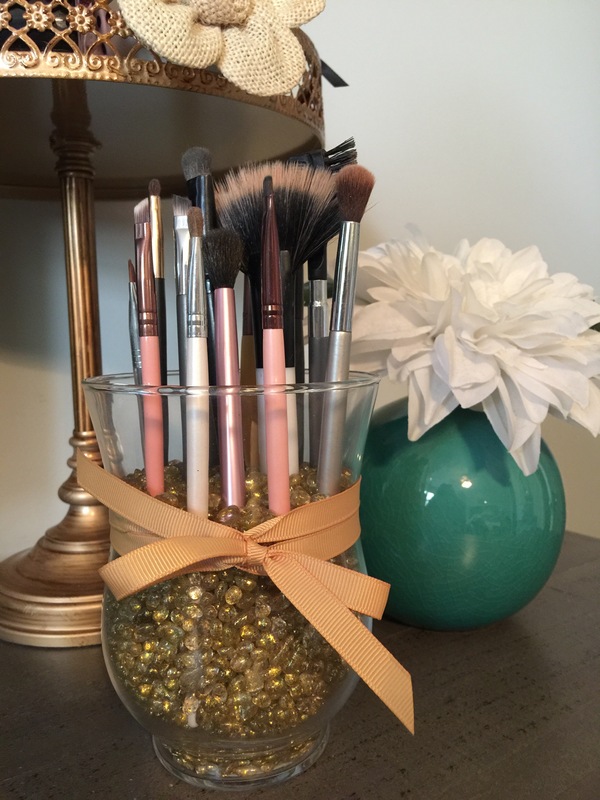 What are some of your favorite DIYs to organize your makeup? 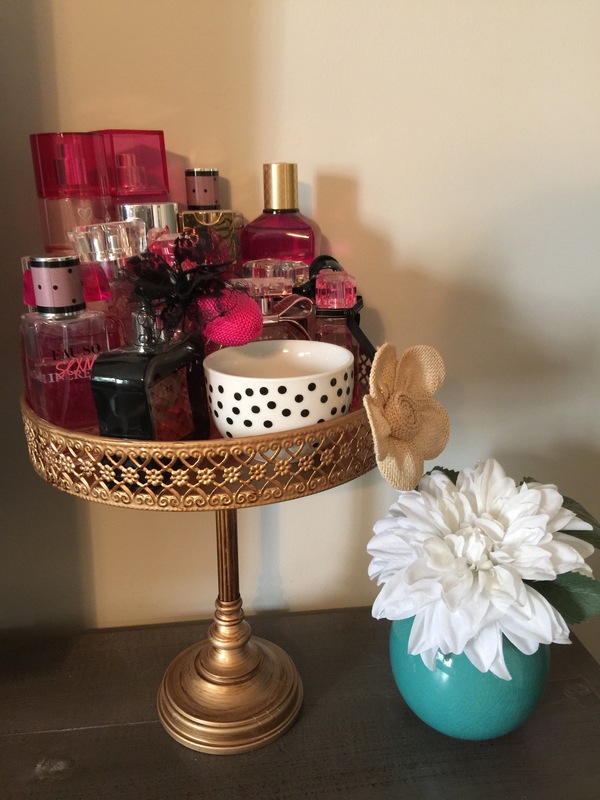 Also while we are on the topic of organization, I found this adorable rose gold cake stand at Home Goods for $13 and thought it would be perfect to display all of my perfumes. The polka dot bowl was a clearance find at Target that I use to put all my perfume samples in so they don’t get lost and are actually used. 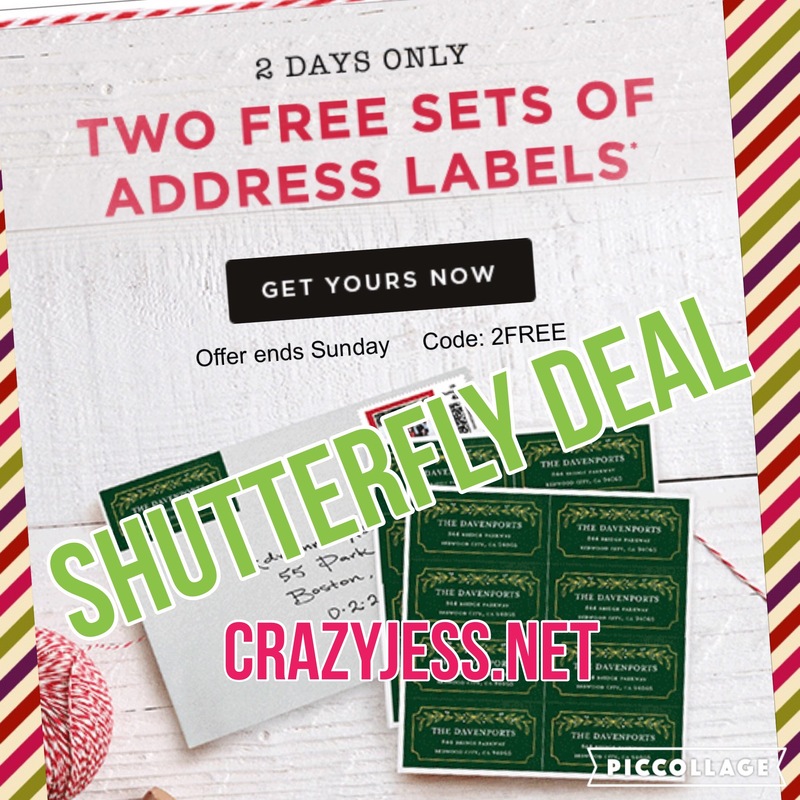 Super cute and affordable and is working well for me. How do you keep your perfumes organized? Comment below and let me know some of your favorite organizational DIY projects for your beauty and makeup items. I’d love to check them out!